A young couple. A handsome groom with his beautiful young bride. Starting a new life, a new chapter together. I wonder what their hopes and dreams were. How they met. This picture only tells a tiny portion of the whole story. The beginning of a story that has far reaching fingers into the future. Reminds me of those photos of the ripples on a still pond. This young couple would go on to have a family of their own. They built a life of love and devotion that would span generations. I don't know this couple. I only know that their names are Jean and Joe. I know they had a family because I was honored to use that beautiful gown Jean is wearing to fashion a keepsake for the precious baby that would be their great grandson. He was baptized today wearing a christening gown using the fabric from his great grandmother's wedding gown. 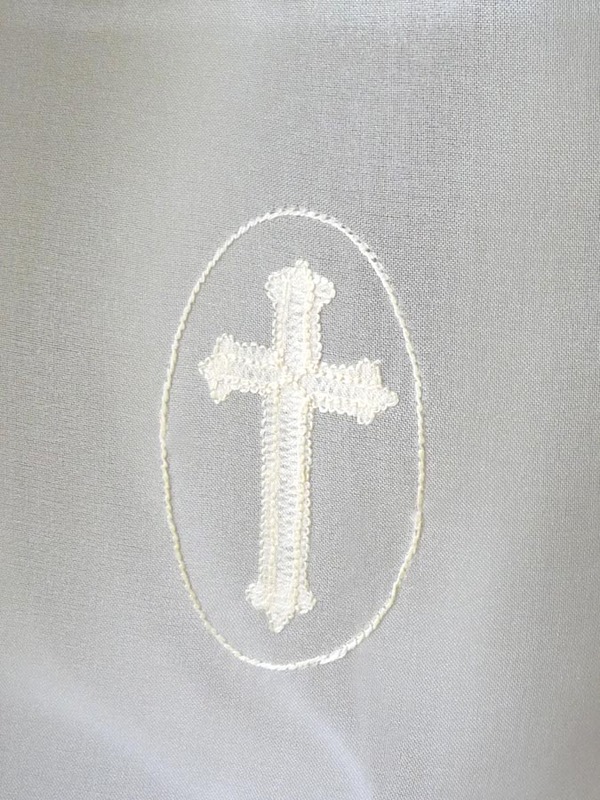 This cross is the simple motif shadow worked on the lower front of the gown. The outer fabric is silk organza. 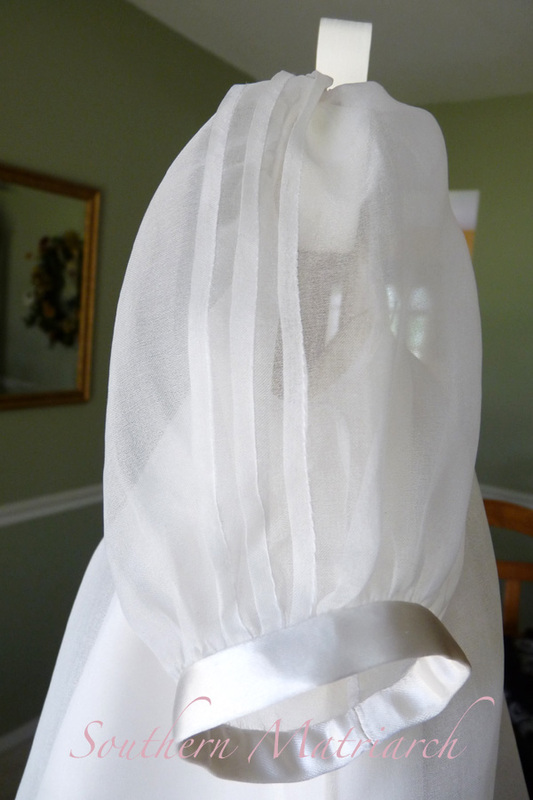 The under fabric is the satin from the wedding dress. First I deconstructed the gown, a little nerve wracking to say the least. The next step I soaked the gown pieces for six days to lighten as well as try to remove the vintage "stored for a long time after being dry cleaned" smell. Even now when the fabric becomes wet you can tell it has retained some of that odor. 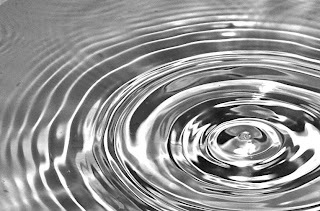 It is not present when it is dry. I meant to take a photo of how much lighter the fabric became. Originally it was a rich parchment color. After soaking and drying in the sun, it lightened to a creamy lustrous ivory. The silk organza was used to further lighten the color as well as to make the gown lighter and airier. Let me tell you, vintage satin is heavy! It is beautiful but heavy. 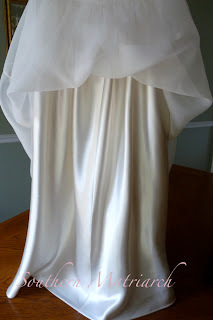 The yoke is a tucked silk organza over the satin. The piping and bias binding on the neck are the satin. Take my word for it when I tell you that silk organza can NOT be embellished with twin needle pintucks. Believe me. I stitched four different yoke pieces trying to achieve that. I finally came to my senses and used folded tucks. It has a very tailored yet gender neutral look to it. Three tiny fish eye buttons complete the yoke. The three quarter sleeves of the silk organza also have tucks and are finished with a narrow cuff of the satin. I wish Jean and Joe could have been there today to witness in the sharing of faith with their newest great grandson. I know they were there in spirit. I have a dog eared copy of the Miracle of Mindfulness by Thich Nhat Hanh. Loved your musings; your gown is exquisite. 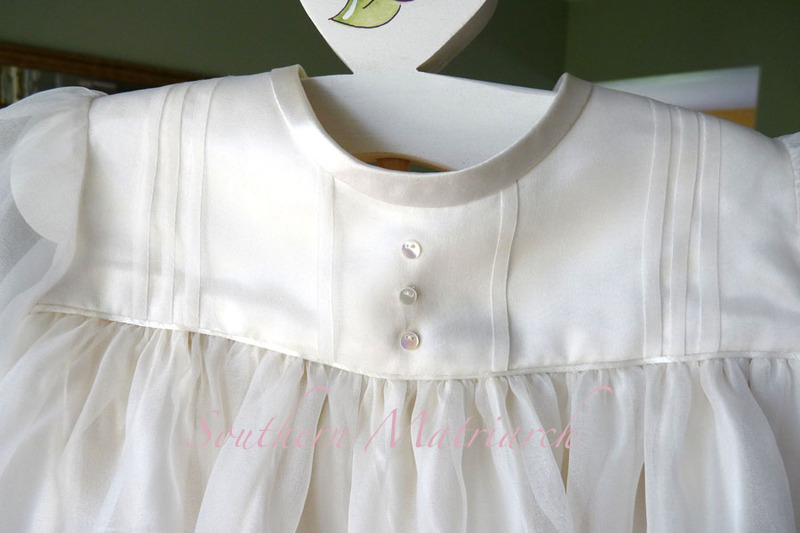 That is probably the prettiest Christening gown made from I wedding dress that I have ever seen. The silk organza does make it light , airy and Christening Gown-ish!! Beautiful. 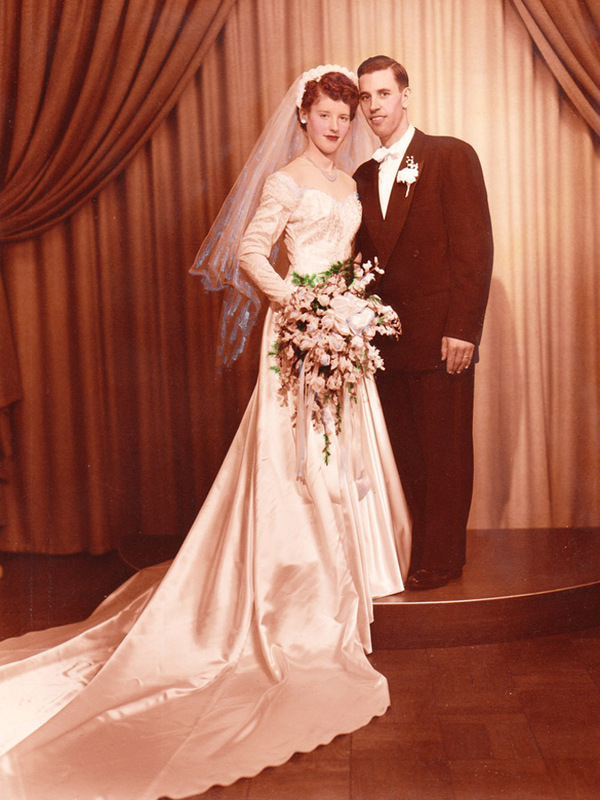 Reading the wedding gown description gave me a jolt, my parents were Jean and Joe too. You did a beautiful job on the CG, it is lovely in it's simplicity. What a beautiful christening gown. It's a wonderful use of the wedding gown. Great job! Perfect gown for a little lad. It will be just as sweet if he has a sister some day! What a wonderful treasure... priceless for the family! I have my wedding gown which is so outdated, but I hope to use it in some way (perhaps the flower girl dress) for my only daughter's wedding! Just too special! 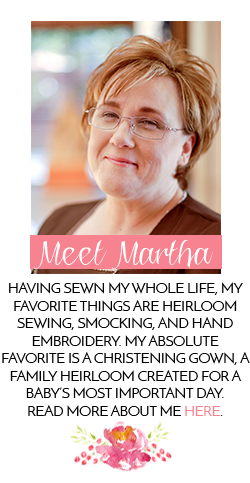 I am new to your blog but old to the love of French hand sewing! 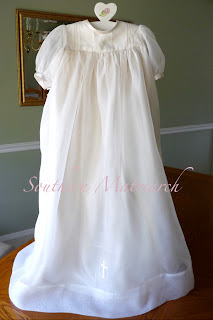 I have a question: I recently pulled out an antique Christening Gown and the slip (made of batiste) has some yellowing areas plus some spots (small) of mold or mildew which are black. I am concerned about preserving the gown but want to remove the spots and discoloration. I have only soaked in Ivory snow and some borax so far. Some of the discoloration went away. The idea of using very dilute Clorox solution scares me. Your thoughts to remove the mold/mildew spots. Thank you.